Thanksgiving is not a uniquely American tradition. 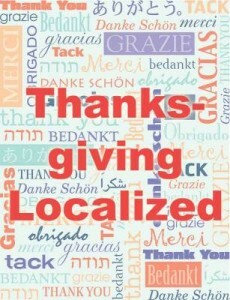 In fact, many countries and cultures around the world celebrate harvest and a special time of giving thanks. Although the languages and customs may differ, the common theme is appreciation of bounty. Let’s explore a few of the thanksgiving traditions around the world, as well as the different ways of saying thank you and showing appreciation in those countries. In Korea on the 15th day of the 8th Lunar month, the nation stops to celebrate Chusok, which means “fall evening.” Chusok celebrates both the harvest and ancestors. The celebration begins on the night of the 14th and lasts for three days. During Chusok, Korean families will visit and clean their ancestors graves. Chusok is highlighted with a feast at night (at times beneath the moon) serving special foods arranged in a specific way, such as songpyon (or songpyeon) that is made with rice, beans, sesame seeds and chestnuts. At Chusok people wear Hanbok (traditional Korean outfits), and they play traditional games and dance. Honor and respect are very important in Korean culture. Depending on the formality of the relationship and situation there are different ways to express gratitude in Korean. For very casual and informal situations, you may say “gomawo” or “komawo” (고마워), which is similar to just saying thanks among family, close friends or classmates or with children. Informally, you may also say “kam sa hae yo” (감사해요) with friends or those younger than you. To say no thank you in Korea, you would say “Aniyo, kwenchanayo” (아니오, 괜찮아요). More formally, with those who are older, have a higher status than you, or who are strangers, you would say thank you by saying “gomapseumnida” (고맙습니다). To express sincere appreciation, in the highest (most formal) way use “kamsahamnida” (감사합니다). This last phrase would be used among your elders, your boss, your instructors or with anyone you want to thank while showing a high degree of respect. It is worth noting that when giving or receiving anything in Korea, it is rude to use just one hand. One always should offer and receive with two hands, and the level of formality is shown by how close to the hand or elbow the second hand is (more formal is two hands together, less formal is one hand outstretched with the other hand on the elbow of that arm). Homowo literally means “hooted at hunger,” and this festival is a celebration between May and August of the annual yam harvest near Accra, Ghana. Homowo also is a time to remember when the Ga people experienced famine. At that time, the people were said to have hooted at hunger before planting their yams and tending their land. After the yams are harvested, the best are prepared for a great feast where the local chiefs bless the yams and all the prepared food. During this festival there are also singing, drums and dancing. While many Ghanians speak English, here are some of the local languages in which to give thanks. To say thank you in Twi you would say “Me daa si,” in Ga you would say “oh-yeh-rah-don” and in Hausa you would say “Naa goodee.” In Ghana it is important to give your host a gift when visiting. In Goa, India, on August 15th, they celebrate Ladin which is a religious festival to the Virgin Mary where people give thanks to God for all the blessings they have received. During Ladin, Christians decorate with colored paper, tinsel, wine, candles, wheat, flowers and plants. The celebration is led by a different person every year, typically someone in need or who has been blessed. During Ladin there is a singing of litany, hymns and music and prayers. Ladin commemorates the harvest of rice. At this time, the first rice is cut and offered to God to ask for blessings on this and future harvests. Ladin is also highlighted by a thanksgiving feast to honor the conception of the Virgin Mary. German-speaking communities may celebrate Erntedankfest or the “harvest festival of thanks” as a religious festival to thank God for the gifts of the harvest. There is no country-wide celebration of this holiday, but it may be celebrated by rural communities between September and October, most often on the first Sunday in October. During Erntedankfest there is often a church service, procession, music, dancing and a feast. Some celebrations also include an Erntekrone (or “harvest crown”) and a lantern parade with fireworks. Most recently, some have observed that American thanksgiving traditions have influenced German celebrations most notably by the inclusion of roasted turkey. Germans have many ways of saying thank you, and they also have variances based on formality. To say thank you formally, most Germans will say Dankeschön or Danke sehr. However, Germans may also say the following. What other worldwide thanksgiving traditions are you aware of? Please share in our comments section. Also, we would be remiss if we did not stop to give thanks for those of you who faithfully read our blog and like and share it with your network.